Originally published in Volume 2, Number 1 of Matters of the Home magazine – July 2013. That getaway could be closer than you think! The most under-utilized space in your home could become a “staycation” for you any day of the week. 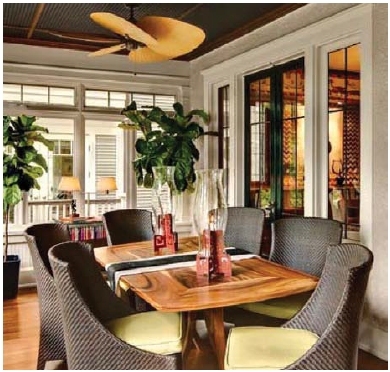 With a few touches to draw the eye and soft comfortable seating to take a siesta or enjoy a good summer read, your screened room or covered porch could have the ambiance of a far away exotic location. Light summer curtains add a tropical feel, and retro bamboo ceiling fans or table top fans are seen in many of the home decor stores these days. Indoor/outdoor rugs have also come a long way with alluring colors and designs that will anchor the space. A lamp that is designed for outdoor use will help you to enjoy the space long into the evening hours, or make a great space to read the morning news. Cool water blues and greens are great colors to make you feel very “tropical” and relaxed. A few patterned pillows will cozy up the space, and ones with durable fabrics are widely available. Bamboo mats, a tray or bowl of shells, and comfortable chaise lounge with a side table will invite you for an afternoon siesta. If your porch has sun exposure that simply makes it too hot to enjoy most hours of the day, then consider enclosing the space with windows. It may be more affordable than you think. Your vacation room will stay cooler, cleaner and more comfortable year round, and you can use any indoor furniture in the space. If your new oasis still receives too much sun at certain times of the day, you may want to consider sun shades to block out the sun without blocking out the view. Many websites offer a wide array of home decorating items that cater to this specific type of decor. Two popular sites to inspire you are houzz.com and pinterest.com. These sites are very user friendly and browsing through them can become addictive. Just type in the description of the decor you are looking for and you will be amazed at the selection of ideas they provide. Can you feel the sea breezes yet?